La noticia de la resurrección de Jesús nos ofrece una nueva luz para nuestras vidas, dijo el prelado del Opus Dei en su homilía de la Vigilia pascual. “Lumen Christi!” The light of the Risen Christ blazes a trail through the shadows of sin and death! This is the joyful message that we want to receive again tonight. The Gospel shows us that the darkness of Calvary is not the last word. 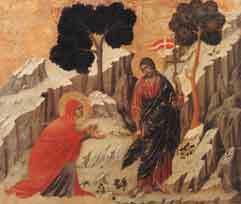 The holy women, who accompanied the Lord in the Passion, lead us toward the light of the Resurrection. The Lord invites us to lead a new life. But what does this newness consist of? In the light of the faith that, as Saint Josemaria explains, "makes us look at everything around us in a new light and makes us aware that, while everything remains the same, everything is different, because all of it is an expression of God’s love" (Christ is passing by, 144). After announcing to the holy women the news of the Resurrection of Jesus, the angel adds: “Go and tell His disciples and Peter that He goes before you to Galilee: there you will see Him, as He told you” (Mk 16,7). The same call is also addressed to us: to go back to our Galilee, to our daily life, but carrying to it the light and the joy of Easter. In order to do this, let us ask for the help of Our Lady, whose face we contemplate tonight shining with joy at the Resurrection of her Son.